The Federal Trade Commission and New York State Attorney General have charged the marketers of the dietary supplement Prevagen with making false and unsubstantiated claims that the product improves memory, provides cognitive benefits, and is “clinically shown” to work. 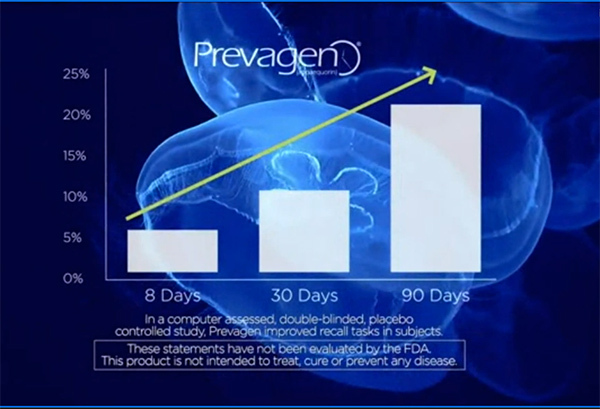 The extensive national advertising campaign for Prevagen, including TV spots on national broadcast and cable networks such as CNN, Fox News, and NBC, featured charts depicting rapid and dramatic improvement in memory for users of the product. In fact, the complaint alleges, the marketers relied on a study that failed to show that Prevagen works better than a placebo on any measure of cognitive function. The federal court complaint alleges that the defendants enticed consumers to spend anywhere from $24 to $68 for bottles of 30 supplement pills by touting the product’s active ingredient – a protein derived from jellyfish – to improve memory and reduce memory problems associated with aging. The complaint notes that the supplement is widely available at major retailers such as Amazon, CVS, the Vitamin Shoppe, and Walgreens, and is also sold directly on the defendants’ websites. Defendants’ product sales have topped $165 million, according to the complaint. The agencies allege that the defendants’ marketing claims have violated the FTC Act and New York state laws. The agencies are seeking refunds for consumers who bought the deceptively marketed product. The agencies have charged corporate defendants Quincy Bioscience Holding Company, Inc.; Quincy Bioscience, LLC; Prevagen, Inc., doing business as Sugar River Supplements; and Quincy Bioscience Manufacturing, LLC. The agencies also charged the two co-founders of the company, CEO Michael Beaman and President Mark Underwood who appeared in infomercials for the product. The Commission vote authorizing the staff to file the complaint was 2-0, with Commissioner Maureen Ohlhausen not participating. The complaint was filed in the U.S. District Court for the Southern District of New York. The FTC is a member of the National Prevention Council, which provides coordination and leadership at the federal level regarding prevention, wellness, and health promotion practices. This case advances the National Prevention Council’s goal of increasing the number of Americans who are healthy at every stage of life. NOTE: The Commission files a complaint when it has “reason to believe” that the law has been or is being violated and it appears to the Commission that a proceeding is in the public interest. The case will be decided by a federal district court judge.